The primary view, the one we’ve all come to know and love, is that of the Hosts and Clusters. Let’s face it, it’s where we all spend 90% of our time. However, this has never sat well with me, particularly since they added in the Datastores and Networking views. I’ll explain why. Firstly, I think everything should revolve around the VMs. For most users, whether they are ESXi admins, Network engineers, Storage peeps, or VM users; are all concerned with the VMs (or at least how their part relates to the VMs). Whatever we do, it should be focused on the VMs. The Datacenter object is the fundamental building block to organizing a vCenter heirarchy. It is reflected in all four views, and draws together hosts, networks and datastores into a container to service a group of VMs. Despite this we focus on the compute cluster. The compute cluster is obviously very important, but is literally only half the story (just CPU and Memory, the other half being Storage and Networks). With the release of vSphere 5 this is even more obvious when we look at Storage DRS and Datastore Clusters. And what is a vDS if it is not a Network Cluster object? 3 sets of objects: compute, datastores and networks each with clusters, organized under the principle datacenter object. The datacenter is the one common thing which ties them all together. So what is the odd man out? VMs (and templates and vApps and Virtual Appliances). The other 3 are infrastructure pieces. They are there to support the VMs. So why do we focus on the Hosts and Clusters view? Secondly, why-oh-why are VMs displayed in the Hosts and Clusters tree view? The VMs are not shown in this way in the Networking or Datastores views. If you step back and think about it, they shouldn’t be in the Hosts and Clusters view either. The Hosts and Clusters view show, erm, hosts and clusters, not VMs. 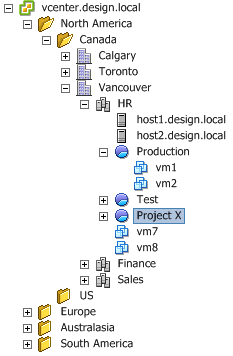 When you highlight a Host (or any object for that matter) in the tree, the VMs are nicely listed in the VM tab. That’s where they should stay. The allocation of VMs to Resource Pools should be done in the main panel, not in the tree view. A biggest issue here is that users think that Resource Pools are a logical organizational object. They’re not, and if you treat them as such bad things can happen. I explain this in my book in Chapter 8. Duncan Epping has a great post The Resource Poll Priority-Pie Paradox, where he explains just the sort of unexpected consequence that can happen (TL;DR – don’t worry, fluffy kittens are not harmed, just some bad resource management). The folders in the VM and Templates view is exactly what most users need here. From the outset they are looking for a simple, logical hierarchy to organize their VMs into silos. Now I recognize that this isn’t a panacea – for example, what happens when you have Production, Test and Development folders, but you also what to group by something else like application or guest OS? Ask anyone who has tried to create the perfect AD structure just how frustrating it can be. The fact that VMs are shown in the left-hand side of Hosts and Clusters view is the reason we all spend so much time there. It makes the VMs and Templates view mostly redundant. A lot of users never go to that view and never create VM folders because they forget it exists. The Hosts and Clusters view is misappropriated for VM work because it’s easy to do so. Yes, I know there is an option to hide VMs from the Inventory view. But it doesn’t persist; as soon as you click away to another object it resets. And it’s not the default. Make VM and Templates the first inventory view. Remove VMs from the tree inventory in the Hosts and Clusters view. I realize that although these are programmatically simple changes, it is a big change for the users as it encourages a different way of working/thinking. But I think these two small changes would go a long way to showing, particularly less experienced users of vSphere, what is really happening. I think your ideas make sense. I am starting to use the vm and templates view more often. I think the reason that I tend toward the hosts and clusters view is that I like to see the physical hosts because that is the only “real” thing and it’s hard to let go and just deal with the virtual. but the more comfortable people get with visualization, the easier that gets. I agree. Each time a new vSphere client is released, the first thing I do is check for a setting to permanently hide vm’s from the host and cluster view, only to be disappointed again. Definitely agree r.e. not showing VMs in the Hosts and clusters view – it drives me nuts. Then to make matters worse they make the setting to disable it nonpersistent – aaargh! In general the GUI for vCentre is poor and hasn’t been shown any love for quite a while. On a 24″ monitor the amount of wasted space is frustrating – I thought fixed layouts died with DOS…. First half: This is a lame post. I should stop reading it. Why would anyone want to remove the VMs from the Host and Clusters Tree?! Second Half: This really makes sense. If it wasn’t so easy to maintain the VMs from this view I’d use the correct view more than occasionally. I really don’t take advantage of folders, and do use Resource Pools to organize. Though, in my defense, I use Resource Pools to organize, because VMware Data Recovery doesn’t support backing up folders, only objects in the Hosts and Clusters View. So if I don’t want to maintain backup jobs everytime I add or move a VM, I use Resource Pools. I would propose two things. One: make the VMs hide persistently. Two: VMware, fix VDR! I agree with making the VMs and Templates view the default view and getting the VMs out of the hosts and clusters view. I’ve been searching through all the roles assignments to see if there is way to assign this capabiltiy to a role, but alas, it doesn’t appear so. To each their own. We deploy role based networking for all virtual machines (VMs), with vDS’s per environment, organizing VMs in the VMs and Templates view is redundant because the various ways we want to represent the data are handled between Hosts and Clusters, VMs and Templates and Networking. Trying to have one view to rule them all is pointless and impossible (it will only support the requirements that you have found to fit its purpose, but it won’t solve the next persons problem). Providing multiple different ways to represent the logical data is really the best way to satisfy the majority.